We have simplified your bookkeeping by including all your website services in one complete package. We include your hosting, email, domain name, and our site management system in our monthly fee so you won't have to worry about getting these services from multiple vendors. Having one less website related expense to worry about will let you concentrate on more important things like growing your business. 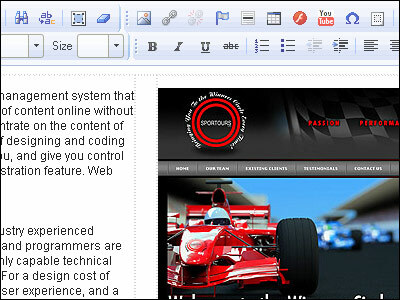 Our WYSIWYG (What You See Is What You Get) editor is as simple to use as a word processor. You can easily add images, tables, videos, bullet points, links, change fonts styles, colors and sizes without any special knowledge of HTML. If you need to do some coding, access to HTML code is also available. You can even undo unwanted page edits. 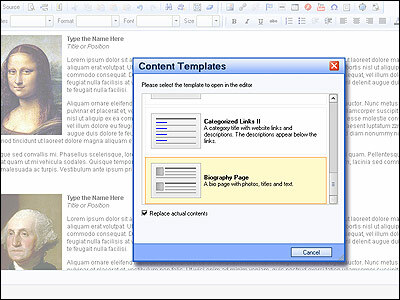 We also include content templates to speed up production for commonly used page layouts. We have designed our shopping cart to make your life easier and let you concentrate on making money online. Thousands of items are easily added manually or imported from spreadsheet files. You can add multiple product photos that are automatically resized to fit the page. The shopping cart also includes quantity discount pricing and coupon code discounts. Shipping calculators for UPS, USPS and FedEx are included. Online payments are easily accepted by popular payment processors like PayPal Payments Pro, PayPal Standard, Authorize.Net, YourPay.com, Braintree, and others. You can even allow checkout by PO. You can easily add a photo album to your website. There's no need to worry about creating thumbnails or resizing your photos because our software will do it for you automatically. Simply upload your photos directly from your computer. A real time saver! Our easy-to-use event calendar is perfect for community and club events, or just to promote the trade shows and expos where you will be exhibiting at. Our calendar also features an event sign up form that generates an Excel spreadsheet of registered participants that you can download. 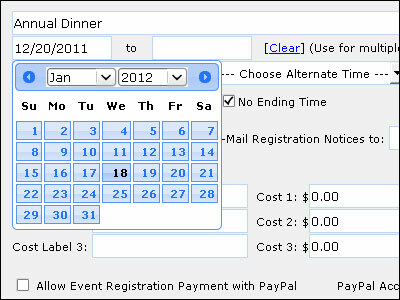 Events requiring payment can also be paid for online with PayPal. Provide customers a way to contact you without exposing your email on the Web. Inquiries are delivered right to your email account. You can also create your own custom forms to gather various types of information using text boxes, drop down lists, and check boxes. Add value to your site by providing links to other websites and online resources. You can easily include a short description and group the links under their own categories. Images, such as logos, can also be included to enhance the link listings. Our newsletter feature is an ideal way to put news articles and press releases on your website. Easily add photos and format the content to your liking with our easy-to-use editor. Multiple pages for your news listings are automatically created. Generate Frequently Asked Questions pages without worrying about formatting the page. Just type in your questions and answers and our software will automatically generate your FAQ page. Enhance your business communication and marketing with a company blog. Create an online community to share ideas and comments about your services and products. Put together a mailing list for your online marketing campaigns or easily contact all of your customers, company employees, or club members. Email recipients can easily remove themselves from the mailing list if they choose to do so. We give you access to search engines and directory submission tools so you can maximize your visibility and attract visitors from online searches. You also get analysistools so you can analyze your pages for keywords, monitor your page ranking on multiple search engines, and tweak your page keywords with our proprietary SEO tools. Our service includes comprehensive visitor statistics and has support for Google Analytics. Easily monitor the effectiveness of your website during marketing campaigns or pay-per-click advertising. 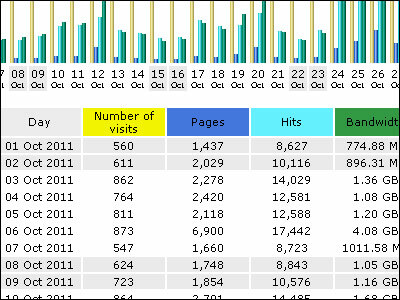 View visitor hits, browser types, the search engine keywords used to find your site, and much more. (what you see is what you get) editor. or you can integrate Google Analytics. ©2019 Fox Valley Webworks, Inc. and its licensors.